Rajiv Gandhi was born on August 20, 1944 in Mumbai. Born to parents, Firoz Gandhi and Priyadarshini Gandhi, he was heir to the political heritage of his mother and grandfather Jawaharlal Nehru, the architect of modern India. He married Sonia Maino, an Italian girl, whom he met during his student days in Cambridge. Rajiv was a pilot by profession. He was never interested in politics but the sudden death of his younger brother Sanjay in a glider accident in Delhi steered Rajiv Gandhi into it. He won the election from Amethi and became a Member of Parliament in 1981. He was appointed general secretary of the Congress party in 1983. On the October 31, 1984 he took the oath as the Prime Minister of the country. 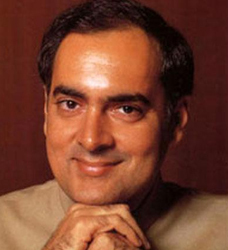 Rajiv Gandhi was the youngest Prime Minister of the World's largest Democracy. He strengthened India's political, economic and cultural bonds with other countries. He was the first politician at the helm to criticize the power brokers who ruled the roost in the ruling party. Rajiv Gandhi found himself in many controversies during the last two years of his Prime Minister ship. He met a tragic end on 21st may 1991 at Sriperumbudur, by an LTTE (Liberal tigers of Tamil Eelam) Suicide Bomber named Tanu, when he was attending an election meeting. The Government of India conferred the highest honour of the land "Bharat Ratna" on him posthumously. Many foundations have been established to cherish his memory for the welfare of society in the fields of Science and Technology, Arts and Culture, and Health and Medicine.